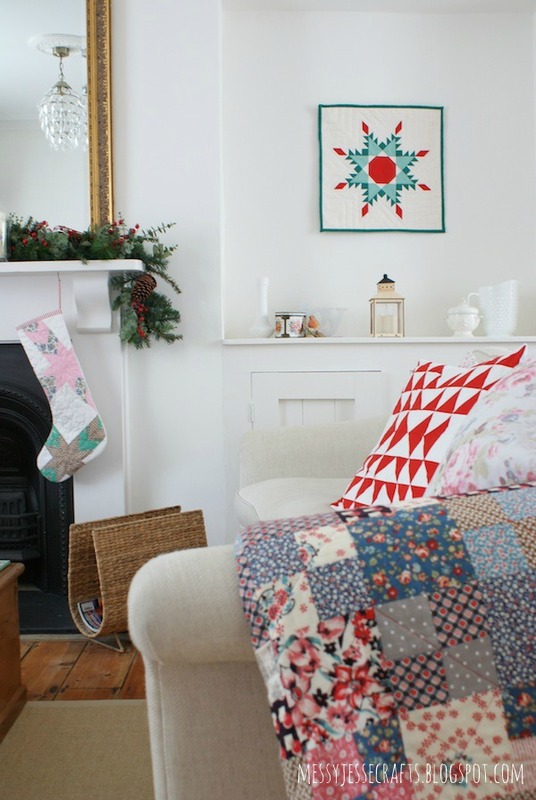 I was completely inspired by these stockings I came across on Etsy, they are made from a recycled vintage quilt, which is such a great idea! Since I don't have a collection of old quilts I thought I would make new 'old' ones. I used 2" 8-point diamond paper pieces to baste the diamond shapes and then laid them randomly on the white stocking background (although they were placed to look like they would form a quilt, so they would have joining intersections if you catch my drift?). I then machine quilted the paper pieced sections, and hand quilted a petal design using this quilting stencil. To give it a nice vintage feel, I wiped it with a clean wet cloth and gave it a good scrunch and left it to air-dry naturally. 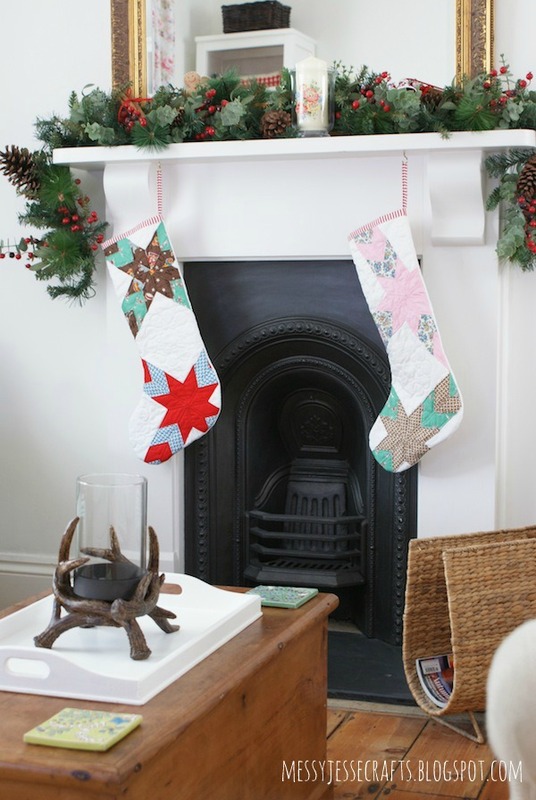 Love the stockings, great idea to EPP them. And your mini is amazing, how did you make it? Everything looks beautiful and I also love those gingerbread men. The stockings are really so nice! and your living room looks pretty cozy. I'm going to steal your whole house, it's like something out of Country Living magazine! 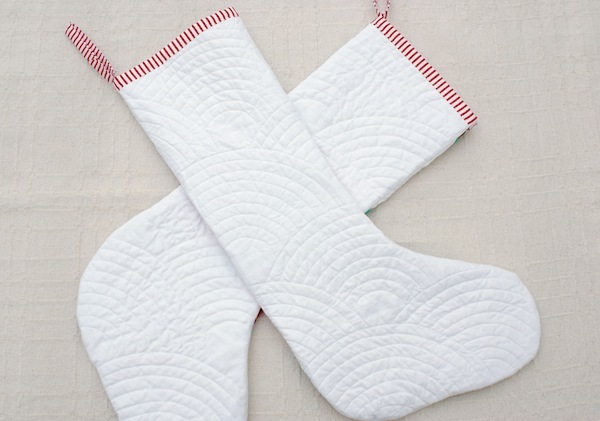 So gorgeous - they do look like stockings made from old quilts. Your stockings turned out lovely! Their 'made from an old quilt' look is perfect. I love your fireplace, and your bright, cozy room. It's such a great feeling to look around your home and see beautiful handmade things everywhere--especially when they're your own creations. Merry Christmas from snowy, icy Michigan, USA! So beautiful! I love the white ones in the last photo. 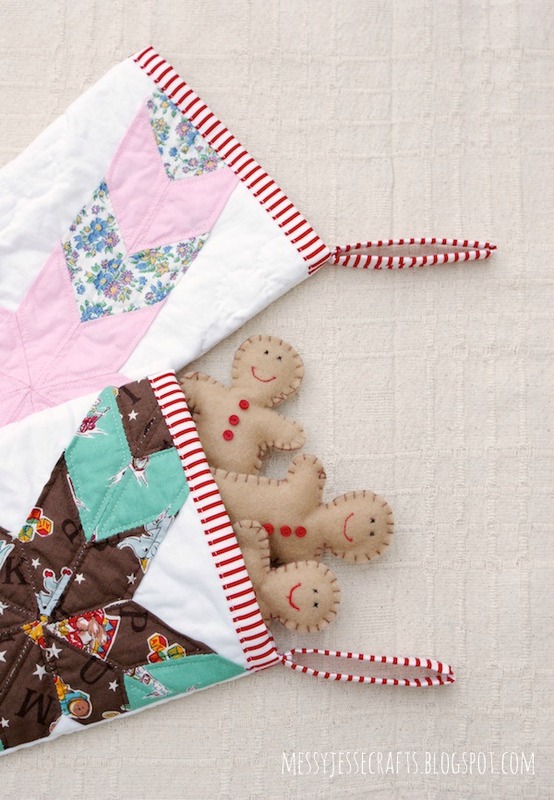 Wish I knew how to quilt, but it's one of those projects I'm saving for when the kids move out :-).